Around this time last year we launched Pipedrive Web Forms, a great way to gather solid sales leads from a variety of places on the web. This feature allows you to send a link to a customizable form in a newsletter or generate a piece of code that embeds it on your own or an affiliate’s website. This feature has proven to be incredibly popular, and as usual, there has been plenty of feedback and suggestions on how we could make it even better. The most frequent request was that users receive a notification when someone filled in the web form. 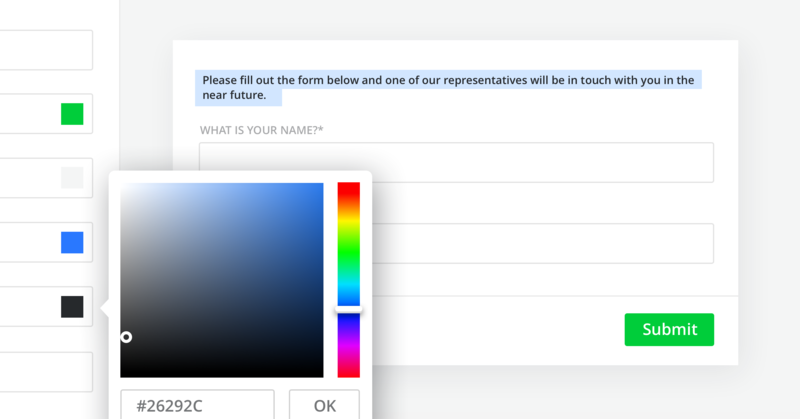 You also wanted more ways to customize the look of these forms so that they better reflected your business and the look of your website or newsletters. The difference in appearance had previously created a slightly jarring break in user experience. We’ve made every part of the web forms fully customizable. Pick the color from a color picker or, even better, add your color code as a number and voila! Pick the font you want to use from a drop-down menu. Beyond that, you can customize every section of the web form individually so you have complete creative freedom. Making a sale sometimes relies on reaction time. Customers might fill out contact requests on more than one website and go with whoever gets back to them first. Our web forms now allow you to enter up to 10 email addresses, all of whom will be notified the moment a deal is created via web forms. Now you can get the jump on your competitors or simply wow your potential customers with how on-the-ball your sales team is. I want it, what do I do? These changes and options are available to you already, so start playing around at your leisure. You can find Web Forms on the Settings page. Please note that this feature is only visible to admin level users.